Besides it relatively small size, Phi Phi Island has a surprisingly diverse and exciting nightlife; from beach bars to Muay Thai boxing matches to ad-hoc parties on the beach or dining on Thai food, everything is available. The simple pleasures of life are away from the bars and the song and dance and can be found on the beach, on the balcony. A gently sea breeze, a glass of wine and the starry night... is paradise. Eating out on Phi Phi Don Village has never been a problem due to the large number of independent and hotel restaurants. For fish there is the Mama Resto with it’s eclectic music and bistro atmosphere, for French/Thai there is Le Grand Blue and Cancun Bar and Restaurant near the pier and the Phi Phi Cabana Hotel restaurant and bar Jungle Bar for an atmosphere to die for. Independents to remember are Unni's, Le Grand Blue and northern European Big food as at HC Andersens for Scandinavian fair and steaks. The immortal Reggae Bar has enjoyed a lot more big parties than anyone can remember and as with many of Phi Phi Island Bars plays a mixture of fun, happy dance music. The Dojo is a bar in the center of the main village and where many meet to get their night under way. It's also one of the main venues where they celebrate after one of the Phi Phi Party Crew tours. 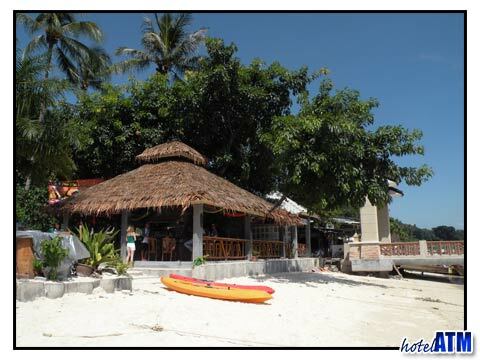 Along the Bay near Phi Phi Andaman Beach Resort, Karma Bar has grabbed the attention of the laid back scene with calm music and mats on the beach. There is also a thriving night scene down on Loh Dalum beach near Ciao Bella Restaurant on Phi Phi Don Villa(Tonsai Village). If you want to have a dance down on the beach, head for Slinky Beach Bar on Loh Dalum. This big bad night starts here every night with a fire show before moving on to a fab dance scene. Staying up at Holiday Inn Resort Phi Phi Island, Phi Phi Natural Resort is enjoyable and quiet. Without the same variety as the village there is a choice amongst the hotel facilities. Staying at the Phi Phi Island Village Resort is less varied, but the remoteness and tranquility of the resort is it’s charm. Water taxis longtail boats run all night even as far as Laem Tong in the north but after dark the boatmen will charge higher prices. When your night is done head back to the main pier and you will be able to pick one up. Prices increase after dark and after midnight so budget correctly and or check prices before you set out.